Summary: Lisa Ummel-Ingram tells the story of engaging her third graders in creating books that honored their lives, language and cultures through storyboarding, sharing, conferencing, gathering information, and illustrating. Student ownership, confidence and language development extended into subsequent years as students saw themselves as authors and learners. This piece provides many details and examples of what worked as well as challenges along the way. It could be a valuable resource for elementary teachers or workshop leaders looking for specific ideas and support for implementing workshop approaches and culturally responsive teaching with language learners. A couple of years ago, I was asked to teach the English language development (ELD) component for a group of third-graders in a dual-language immersion class. The class consisted of twenty-one native Spanish speakers and two native English speakers. They had been together since kindergarten and were just beginning their first year of formal instruction in reading and writing in English. We met each day for forty minutes right after lunch, a point also known as that prized time of day when the need for a nap creeps over, and sometimes conquers, the classroom. During that time, students filed in from their immersion classroom just next door and had the opportunity to experience writing workshop. While this group of students wrote in their immersion classroom and had been exposed to some journal writing in previous years, they had not experienced the workshop approach to writing prior to attending this ELD class. More important, they had not been given the opportunity to discover the influence and inspiration that writing your own story carries. For years I’ve tried to find an effective balance in the amount of time I spend teaching the different types of writing. My experience has been that narrative writing not only motivates students to write, but that this motivation is the key to progress in other types of writing, i.e., expository writing, persuasive writing, report writing, writing in other content areas, or creative writing. Nevertheless, the legitimate pressure of standards and of state-mandated writing tests keeps this concern for balance in the backs of teachers’ minds even when narrative is used as a stepping stone to other forms of writing. My theory, and the impetus for the personal narrative writing project that this article describes, is that students are motivated to write when they are encouraged to write about their lives. In Changing My Life Forever: Giving Voice to English-Language Learners, Maureen Barbieri accurately expresses my reasoning for offering personal narrative as a way to help English language learners negotiate the challenge of learning a new language in a new culture. She states, “The challenge is to discover who they are now, who they want to be, and who they can be, while holding on to all they cherish about home and family” (2002, 82). While not excluding other types of writing, I purposely plan personal narrative experiences for the first quarter of the school year. My goal is to give English language learners in my classroom, and in this case, my ELD class, opportunities to personally and meaningfully connect to writing. So, although other types of writing are not excluded, the first quarter of the year is focused on the use of personal narrative to tell our own stories. The relevance of storytelling as it applies to culture is another balancing act always present as I consider children’s writing. Kathryn F. Whitmore, while studying Arizona third-graders’ authentic language, literacy, and culture, wrote that “Teachers in some geographic areas have a specific responsibility to meet the needs of children from local cultures (the Native American and Hispanic populations of the Southwest, for example) (Whitmore and Corwell 1994, 208).” She cited an example from Literacy Events in a Community of Young Writers by Goodman and Wilde, a book based on a study of written language development in the Tohono O’odham community of southern Arizona. The authors acknowledge that “the Tohono O’odham children’s writing reflects their cultural heritage and the oral tradition of their storytelling” and that they use “the ‘power of words’ as they write, gathering insights from their own experience, from their community, home and family, to write” (1992, 209). Operating from this point of view, I set in motion one of the most powerful writing events I’ve experienced in my teaching career. 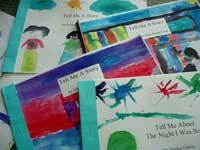 One weekend early in the school year, while searching the local bookstore for literature conducive to drawing out students’ stories, my eyes were drawn to a colorfully illustrated book titled Tell Me Again About the Night I Was Born by author and actress Jamie Lee Curtis. I added this book to my collection of read-alouds in the category of family and friendships, inviting my English language learners to experience the excitement of writing their own stories. Reading aloud and sharing personal stories had been an integral part of this class, but this book caused magic to happen. I believe it was the combination of the commonality of the topic, the connection students were able to make with families as they shared stories, and, of course, the discovery of writing as a way to tell your own story. After exploring some of the vocabulary in the book, students settled on the floor for a whole-group reading. With much attention paid to the colorful, childlike illustrations in the story, they discussed their favorite parts of the book and made connections to the reading by recounting some of their earliest memories. Their assignment for the evening, although I’m sure part of the lure of this class had been that there was no homework, was to discover the story about the day or the night they were born. As the students left the classroom, I sensed the first hint of magic in the room. I wouldn’t fully understand its power until the project was complete. The next morning, several students raced to my classroom before visiting the cafeteria for breakfast or checking in with their homeroom teacher to tell me they had their stories. I knew ELD class was usually considered the “fun” part of the day for this group of students, but I had never seen this level of excitement about writing. Throughout the morning, a few more students peeked into the room to ask, “Mrs. U-I, (using the initials for my two complicated-to-pronounce last names) are we having ELD?” By the time the group tumbled into my classroom after lunch, many of them were near bursting, anxious to tell their stories. Their voices spilled out on top of one another—like water from a fountain—as they traded stories and discussed the options of writing in English or Spanish, a choice always offered to them in the draft stages of writing. Here and there I saw the flash of dog-eared pieces of paper; some students had actually written down their stories even though that hadn’t been a condition of the assignment. As a way to capitalize on their excitement, I asked students to get into groups of three or four and to share their stories with each other. Right away, a hush fell across the room; then, just as suddenly, there was a flurry of movement and excited voices as students settled on the floor and at tables to share their stories. When they finished, I explained that we would write our stories, map them out on a storyboard, and illustrate them with watercolors. As I explained the project, the end result being their very own published stories, I focused their attention on the story of my birth displayed on chart paper, along with the first few frames of my storyboard and baskets of paints and paper. There was a literal race for paper and pencils and a few minutes of getting settled before a hush fell over the room, and then they wrote. We spent the next week writing. As students needed help, they were directed to resources in the room that would help them make their writing “better,” their all-encompassing word for process writing. These resources included topical word lists complete with illustrations, Spanish/English dictionaries for children, favorite books, each other, and writing conferences with me. As they finished their stories, they met with me again, the purpose of which was to check for focus and to make a decision about publishing their stories in English or in English and Spanish. Most students were in the intermediate fluency stage of English language proficiency, although some were still writing in Spanish. As a result, many had written their stories in English with some words and phrases in Spanish. As Cloud, Genesee, and Hamayan point out, this “language borrowing” is done when students mix the two languages and a word or phrase that cannot be retrieved in one language is borrowed from the first language (2000, 63). While a couple students typed their own stories, most publication efforts took place at a computer, with me typing at high speed and the student standing over my shoulder reading and negotiating meaning between languages. A conversation with one student in particular, who had written her story in Spanish and insisted that it be published in English, exhibited the energy she focused on making sure I translated her Spanish into English exactly as she intended. Dulce: “My hair was bald…no, my head” (laughing). Over the next several weeks, students finished their stories and mapped them out on storyboards. Their storyboards were standard sheets of paper divided into eight sections, each containing the first few words of that particular page and a quick sketch to help them connect the illustration to their writing. This strategy, new to this group of students, was designed to help them transition from our previous practice of writing stories as a whole group and making class books. This would be their first experience planning and writing individual books. The storyboards became the plan for each student’s book. We then set up newspaper-covered tables where groups of four or five shared workspace, paint, water, and the ever-present paper towels for clean-up detail. The room became a factory, with each student at a different point in the production of his or her story. This writing experience was a powerful tool in the process of helping English language learners understand the power their stories held, in more ways than I had imagined when creating the assignment. First, students made a connection to their families as they asked questions about their birth, many hearing the stories for the first time. Elizabeth, a native Spanish speaker, came to my classroom one morning before school began. “Mrs. U-I, mi madre wants my libro hoy,” she said. (“My mother wants my book today.”) Elizabeth knew that the book wasn’t finished but continued to convey her mother’s attempts to hurry the process in order to share the book with family members visiting from Mexico. A second powerful piece of this assignment was the opportunity for students to use art to convey their stories. A strength for many of my students, art provided a nonverbal, leveling ingredient to the assignment. Each illustration also served as a source of pride in their families. So much so that at several checkpoints I found that Raphael had painted many more pictures than he had planned for his story, including painting after painting of his entire family. Although Raphael and I looked through picture book after picture book for examples of how art accompanied literature, I was never able to convince Raphael that he needed one picture for each page of writing. Instead, I eventually honored his decision to paint as many as three illustrations for each written page. He was thrilled with his completed work and chose to read it proudly at the author’s microphone during our book party. As he began reading, he stood tall and—while showcasing a vivid illustration of his family—announced that this was the first book he had ever written. Early on in the project, thinking back to our initial reading of Tell Me Again About the Night I Was Born, I had wondered what it was about this book that resulted in such a meaningful writing experience. Now, however, I understood that the magic wasn’t the book. The most important component of the project was the thrill students experienced as they became authors and heard their voices echo back their own stories. The genuine value each student felt as he wrote, published, and read his book transformed this class of English language learners. This could be seen, not only in their eagerness to share these stories, but in the frequency with which they wrote stories about their lives from that day until today. It was not unusual to find a student working on a story before school, at lunch, or during another content area class. Today, as fifth-graders, they are still eager to write, not just in the form of narrative but in other genres as well. In addition, each student had an opportunity to tell a story that was uniquely hers. Among them, one student, who lived with her grandparents, related the story of using a pay phone to call her mother in California to ask about the day she was born. Another chose to write a story told over and over in his family about his first birthday, rather than relate his birth story. Jose Juan began his story with his birth and continued with “Tell me again about coming to Oklahoma City. Tell me about when the milk was gone and you used water.” Rafael told about the countless number of family members who visited his hospital room in the hours before he was taken home by a procession of relatives. As the project ended, twenty-three students wrote and read their stories with obvious ownership and pride that in every respect exceeded my greatest expectation. Although this writing experience was powerful for students in many ways, we did encounter several challenges along the way. Some came from outside my classroom. A few teachers in the building, for example, while acknowledging that this work was fun for students, questioned whether that much writing accomplished either the teaching of English or of writing skills. And then there was the teacher on my third grade team who daily stuck her head in the door to chirp “Still painting?” in a high-pitched friendly voice. Despite the fact that the length of the project obviously caused some concern, I defended my use of time, watching the days disappear and the work continue. In addition, as confident author-students incorporated their writing into their watercolor illustrations, I still had questions of my own about who should correct student writing and how much should be corrected. As Peitzman and Gadda relate, students should be provided with “a model for correctness—giving correct spelling and grammatical structures” with a focus on content (1994, 111). Having already fought the battle of teaching isolated skills versus providing meaningful assignments, I generally invited the skeptics to visit the class and see what was going on in addition to the fun. In the end, a few teachers did acknowledge the learning that had taken place through projects that were not focused on traditional spelling and language arts texts. And, ultimately, although there were still some who doubted the success of this writing experience, I knew what I knew: it had strengthened this group both as writers and as learners of English. The proof was in the final product and in the faces of authors as they shared their published stories boldly and proudly. While becoming writers and learners of English, this group of third-graders was involved in a writing experience designed to pique their interest in writing and to value their stories. Writing personal narratives resulted in a new willingness to write and to express themselves orally in English. Several students, previously hesitant to write in English or to even speak out in class, found new confidence as speakers, readers, and writers of English. Shy Giovanna began to write poetry, surprising me now and then with the gift of a poem sealed in a homemade envelope. Mario, usually unresponsive to attempts to interest him in writing, began participating in writing workshop. 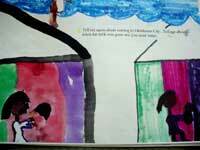 Elisabeth and Melina coauthored reports of neighborhood and schoolyard injustices for the class newspaper. This confidence, still evident in this group of students today, continues to facilitate success. As fifth-graders in my social studies class two years later, they researched, planned, and created historical accounts of journeys on the Oregon Trail; created journals as if they were present during the expedition of Lewis and Clark; and composed editorials shedding light on local issues of equality and social justice. How did this happen? As a result of telling their own stories, they truly experienced the inspiration and magic that took place as they recognized themselves as authors. Barbieri, M. 2002. “Change My Life Forever”: Giving Voice to English-Language Learners. Portsmouth, NH: Heinemann. Cloud, N., F. Genesee, and E. Hamayan. 2000. Dual Language Instruction: A Handbook for Enriched Education. Boston, MA: Heinle & Heinle Publishers. Curtis, J. L. 1996. Tell Me Again About the Night I Was Born. New York: HarperTrophy. Goodman, Y., and S. Wilde. 1992. Literacy Events in a Community of Young Writers. New York: Teachers College Press. Peitzman, F., and G. Gadda. 1994. With Different Eyes: Insights into Teaching Language Minority Students Across the Disciplines. The Regents of the University of California: Addison-Wesley Publishing Company, Inc.
Whitmore, K. F., and C. G. Corwell. 1994. Inventing a Classroom: Life in a Bilingual, Whole Language Learning Community. York, Maine: Stenhouse Publishers. About the Author Lisa Ummel-Ingram is a teacher-consultant with the Oklahoma State University Writing Project. She teaches middle school reading and writing at Wheeler Community Learning Center in Oklahoma City and is a member of the NWP New-Teacher Initiative Leadership Team.